You’re reading this article, which proves that you’re at least thinking about retirement. But I’ll take it a step further, and assume that it’s likely you are currently waist-deep in the retirement preparation process. That’s great! Unless, that is, your decisions are unwittingly taking you down the wrong path. How do you really know if the decisions you’ve made so far are the best ones for your future? How do you know that you’re not making a mistake today that’s going to cost you big time some 20 years down the line? 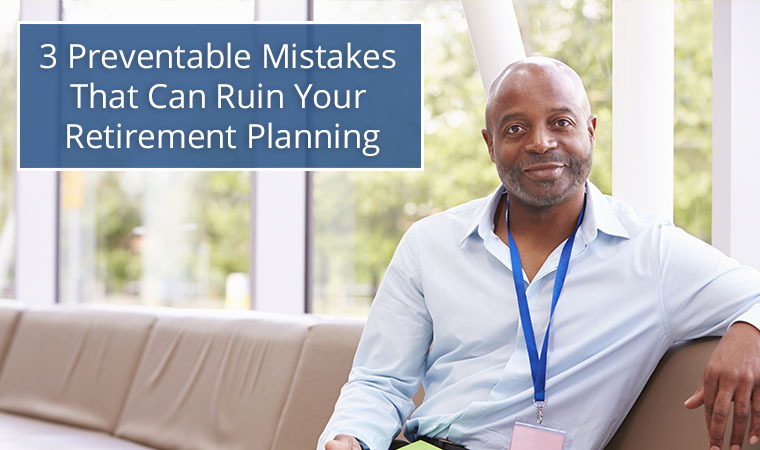 What follows are three of the most common mistakes that even the most conscientious savers make as they hit the final stretch of the retirement preparation process. 1. Not understanding the risk in your portfolio. Every few days someone comes into Hanson McClain for their first appointment—someone with over $1 million saved—and we run their existing asset allocation through our Portfolio Stress Test. Guess what happens? We test their portfolio against various historical scenarios, and we find that there’s a very real possibility that if the market went into cardiac arrest—let’s say it dropped by 40 percent—that their savings would very likely get wiped out. And, usually, this revelation takes them completely by surprise. That’s because a shocking number of people have no idea, as in, NO IDEA WHATSOEVER just how much risk they are carrying in their portfolio. Our Portfolio Stress Test takes your asset allocation and compares it to as many as 24 historical major market events to see how your investments are likely to respond in a crisis. Here’s a warning: If you do nothing else in the next two weeks, get the allocation of your portfolio tested. You’ve worked extremely hard for your money, and it would be a tragedy to see all that disappear because of a terrorist attack, a natural disaster, or an inexplicable stock sell off that causes the market to crash and then takes your money down with it. I can’t emphasize this enough: Get stress tested today. 2. Putting your kids before yourself. This is one of the most difficult things I ever have to tell a client, but sooner or later, you’ve got to think of yourself. I’m a parent of two wonderful children who have both recently gone off to college. It’s hard to let them “go.” But for many clients, what’s even more difficult, is reining in the money train, both during college and after. But here’s what I ask them: Do you want your kids to have to support you in 20 years? Because that’s exactly what could happen if you get into too much debt (or fail to adequately save) while supporting them. We live in a time when our children stay financially dependent longer than they did in previous generations. And while that allows our children to (hopefully) get a more secure “launch,” I’ve seen it place the retirement of many of my friends at risk. When and where to draw the line is a very personal decision. But I’ve used this warning more times than I can remember: In 20 years, do you want your kids to have to support you? Sometimes, doing what’s hard now is best for everyone later. 3) Waiting too long to hire an advisor. While you might have expected this, there are some very good reasons why it’s on my list. First, when it comes to money, a lot of people think they’ve got it all figured out. And why not? You’ve had a good career. Maybe you’ve maximized your 401(k) for 20 years? Maybe you even have a little extra savings? Unfortunately, a lot. You might be surprised by the number of smart people I meet with who are just a couple of years from retirement, and who are worth, say, north of even $1.25 million (on paper, that is), but who still owe $400,000 on a home, and have, say, an additional $25,000 (or more) in debt. These people are most definitely not okay. And their first mistake? It’s when they take the time to consider hiring an advisor, but then only bother to calculate the potential for the added returns of professional management without ever considering everything else that an advisor has to offer. First, what you need to understand is that it’s one thing to pay a $4,000 per month mortgage when you are making $125,000 a year. But it’s another thing entirely to try and survive on that not-completely-liquid $1.25 million when you have $425,000 in debt and no income. If the above is your scenario, and you choose to “go it alone,” my experience has been that the odds of you running out of money in retirement are… vastly greater. A competent fiduciary advisor (the fiduciary part is very important!) is going to work with you to get that debt under control, and help you put your money to work so that you aren’t spending down your principal (that too, is also very important). Then that advisor should explain what insurance you need (and what insurance you absolutely do not need), what accounts you should draw from (the sequencing matters), whether you should consult with an estate planning attorney, whether you should consider downsizing your home, and so on. I’m an advisor. And whether the above description fits you (I could have used literally dozens of scenarios to make my point), or not, do not wait until you are just a couple of years before retirement to hire someone like me. The complexities of modern retirement, coupled with our inflexible tax laws and ever-evolving Social Security regulations, are but a few of the hundreds of reasons you need your ducks in a row well before you stop working. If you’re a consistent reader of my articles, you understand that the primary focus is education. When Pat McClain and I founded Hanson McClain some 23 years ago, a large motivation for the both of us (having briefly worked for a firm that wasn’t at all interested in truly meeting the needs of clients) was education. It’s one of the reasons we host a weekly radio program (Hanson McClain’s Money Matters), while giving several dozen financial literacy workshops each year. What we’ve realized in the last 23 years is that not everyone learns the same way. That’s why our educational materials are so varied. For instance, if you’re looking for a deep dive into the retirement transition process, you might like to read my latest book Personal Decision Points. But if you’re someone who learns best by watching and listening, then our 7 Personal Decision Points webinar would be best for you. And, lastly, if time is an issue, and you’d just like an easy-to-digest introduction to the retirement transition process, our 7 Personal Decision Points digital guide can give you an overview of the basics without weighing you down. The choice is yours. But whatever you decide, I hope you’ll take some time to reflect on the content of this article, and then take a moment to familiarize yourself with the information contained in the useful pieces mentioned above. In the end, it’s your retirement. And I very much want you to make it everything you’ve dreamed it would be.